about this book: My latest book, Isia's Secret, started life when I read an article about Cypriots being allowed to visit one another across the island's border. It brought back some vivid memories for me and inspired me to write something about my own experiences on the island. In 1974 I visited Cyprus and toured an island that for over two decades had suffered a brutal civil war over issues concerning Greek sovereignty. One could feel the tension and EOKA graffiti was everywhere. Used as a political pawn by the USA and the UK as well as Greece and Turkey, both Greek and Turkish Cypriots suffered physical atrocities and economic starvation. It was a confused war with Greek factions fighting each other as well as the Turks and both fighting the British at the same time. America eventually, it is rumoured and I believe to be true, hand shook a deal with the Turks that the US listening post on the north of the island would be allowed to stay. The cold war was at its highest and America had used Cyprus as a strategic base for listening in on Russian communications traffic. The British were warned off of blockading the northern ports and a month later, three weeks after I went home, the Turks invaded unopposed. The Greek community suffered as the world looked on. Eventually the north was declared a Turkish Republic and the UN set up posts along the 'Green Line' border. Forty years later, nothing has changed apart from the island becoming part of the EU. Over 100,000 Turkish troops occupy the north and trespass on EU controlled land, a clear sign of the ineffective power of Brussels. I began writing as a child and as I grew out of my teens, started a career in the entertainments industry in stage management. Writing became a passion and after several attempts at writing my first novel, I finally wrote a chase thriller, The Trojan Towers. Then came the article I read in a newspaper and my thoughts immediately tuned into a story plot I could write and use as a platform, airing my views through my main character, a savvy Irish political columnist. I took just a year to write this and it was not until I had the idea for the main skeleton in Paul Hrisacopolis' cupboard that I realised I had found a way to show how love breaks down cultural and religious differences, something we should all embrace. I think this book, a political thriller, will appeal to anyone over the age of twenty, especially those who lived through the sixties and seventies as well as those who have visited this wonderful island. Enda Osin has upset Number 10 and the Whitehouse and been slapped on the wrist. Losing his column, he is given a job writing a 'nice' piece for the Sunday supplement about Paul Hrisacopolis, a Greek billionaire who wants sovereignty for Cyprus, as did his father and a son, George, who died in 74' at the end of the Greek campaign. Paul has offered to transport the Elgin Marbles from London to Athens aboard the flagship of his cruise line, hoping to gain support from EU politicians who will vote him on to a special trade committee from where he can influence decisions on Cyprus. Enda is helped by Jessica Du Ross, a beautiful West Indian, half his age and with whom he falls in love. Together they start to uncover skeletons from Paul's past and the man's terrible plot to start civil unrest on Cyprus. Their investigation is further complicated when they discover Paul has an 'enemy within' plotting his downfall through a Turkish terrorist group and an imposter claiming to be a long lost grandson. With their lives in deadly danger, Enda and Jessica are finally involved in a climatic sea fight as terrorists board and sink the ship and the truth is finally revealed in an unexpected final twist. • Caleb Pirtle - A novel that's written by a poet and has language that's as beautiful as the plot is intriguing. • Flo Ginsburg - brings to mind writers like Tom Clancy and John Le Carre. This is such a fast moving spy thriller that you almost need a 'who's who' to keep up with the ever- changing list of characters. However, as it is well written I'm prepared to forgive the author on this occasion. The story is set against the backdrop of Cyprus in 1974 and takes us from there to the present day passing through Turkey, Greece, the South of France and various other locations that are described in such detail that the reader feels immediately transported there. If you like political thrillers and investigative journalism, you will definitely enjoy reading "Isia's Secret" as it is one of the best examples of this genre. Enda, a journalist, is given an assignment to write an article about a Greek tycoon, Paul Hrisacopolis who seeks Greek sovereignty for Cyprus. Although he is asked to write something 'nice', he decides to look deeply into Hrisacopolis's past. He teams up with Jessica, his lovely and smart assistant to reveal the truth about Paul Hrisacopolis's greedy plans and his family secrets. As they put different pieces of a puzzle together to disclose Isia's secret, the POV frequently switches from first person to third person. I especially like this technique of storytelling as the reader can see the story from different angles. 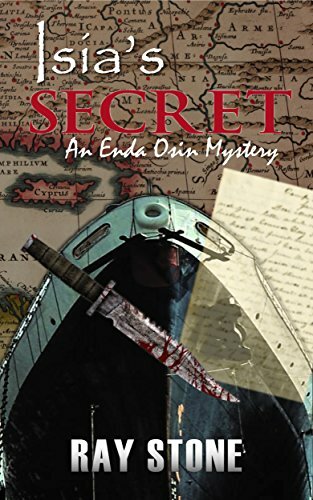 "Isia's Secret"is a dazzling and enjoyable read which takes you to an adventurous journey from London to Cyprus and Istanbul. Raymond Stone artistically and brilliantly uses some historical facts to create an intriguing storyline for his novel. I very much enjoyed the characterizations, the relationship between Enda and Jessica and the vivid description of different settings. I suspect this is not the first book by Stone or if it is he is a fabulous undiscovered writer. The story about Cyprus is well documented and to see how many of the facts have been written in to this fiction serves as a reminder that the Island's troubles still need sorting out. The story is about Enda Osin (I fell in love with him) a wonderfully painted character, as are all the characters in this book. Enda and Jessica Du Rosse are told to write a story about Hrisacopolis, a Greek billionaire who wants Greek sovereignty for Cyprus and will stop at nothing, including murder, to get it. He is after a chairmanship of an EU committee from where he can use his power and influence to cause civil unrest. The descriptive work around this sometimes complicated but intriguing plot is also worth noting. 5 stars for me and I hope the next book in the series is just as good. Isia's Secret is a great political story that shows what can happen when money corrupts and buys position and power. It tells of one man's obsession with trying to realize a political dream from the past. Enda Osin is a great character complete with Irish wit and his partner is a beautiful woman half his age, Jessica Du Rosse who he falls in love with. Together thy uncover the tragic secret about Isia, a young women who died after leading a terrible life. They end up discovering an imposter, involved in murder, and foiling a terrorist plot. The characters really stand out. The climax is nail biting and I loved the way the story ended with a couple of really good twists. Most of all, I loved the way the various places in the book are described. I really enjoyed this book and I hope Stone writes another book about Enda Osin soon.